Victor Radley opened the scoring. AAP Image/Brendan Esposito. 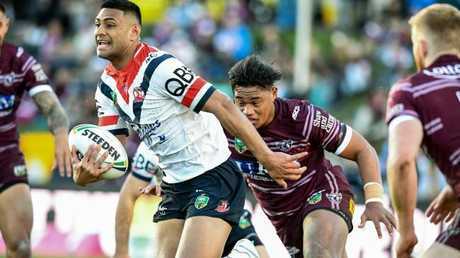 THE Sydney Roosters have fired a warning shot at their premiership rivals, flogging Manly 56-24 to rack up the equal-highest ever score against the Sea Eagles at Brookvale. The Roosters ran in 10 tries to three in their best attacking performance of the year to ram home their spot in the competition's top four. The result means they are just two points behind ladder-leaders Melbourne, St George Illawarra and South Sydney with a comparable for-and-against after their biggest win of the season. With a host of former players watching on for Golden Eagles day, the thumping was the first time Manly have conceded a half century at the ground since July 2004, and their worst defensive effort since Canterbury also beat them 56-24 in 2003. It also marked their fifth consecutive loss at Lottoland - the first time they have dropped so many games at the ground since early 2004. The Tri-colours tore through the Sea Eagles at will in the first half, breaking their defensive line eight times in the opening 40 minutes with Daniel Tupou making light work of them on the left and Blake Ferguson scoring twice on the right. It was the equal highest amount of points the Sea Eagles have ever conceded at home. AAP Image/Brendan Esposito. Ferguson did so almost on one leg, struggling with a left ankle injury for the majority of the first half before recovering after the break. Centre Latrell Mitchell also bagged a double, his first coming from a perfectly placed Cooper Cronk cross-field kick and his second when he bamboozled two defenders as he stepped past them to score. Jake Friend was also dominant out of dummy-half and was arguably the Roosters' best in the flogging. He provided the last pass for one of Ferguson's tries and grubbered a kick through for one for Lindsay Collins for their first points of the second half. Boyd Cordner, Joseph Manu, Sio Siua Taukeiaho and James Tedesco also both crossed, with the latter finishing with 276 metres and four tackle busts. 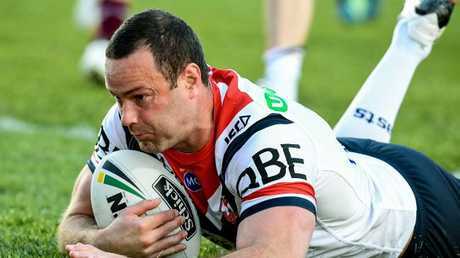 The Roosters are finding the form that made them premiership favourites. AAP Image/Brendan Esposito. Tom Trbojevic proved the only real resistance for Manly, three times pulling off last-ditch tackles at the back, as he also scored once himself and set up another for Daly Cherry-Evans. Second-rowers Shaun Lane and Frank Winterstein scored the Sea Eagles' other two tries, Manly now sitting just one win clear of the three teams equal on 10 points at the bottom of the ladder.